The basque climber Irati Anda has done White Zombie, 8c in Baltzola. The mayor of Prague Pavel Bém has changed his plans on Mount Everest. He is going to set out for his Mount Everest summit atempt tomorrow. 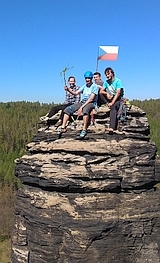 Ondra Benes climbed the hardest route in Czech R. 8c+?